The Ayodya Resort Bali enjoys stunning views over the Indian Ocean with glimpses of the secret mountain Gunung Agung in the distance. Located in Nusa Dua, approximately a 30 minute drive south of Kuta and the International Airport, this Bali accommodation offers guests a great choice of rooms and suites, and facilities such as restaurants, bars, a day spa and kids club. The Ayodya Resort Bali is also located a short drive from Jimbaran where you can treat yourself to a fantastic seafood dinner at sunset, or experience Bali's most famous temple at Uluwatu. 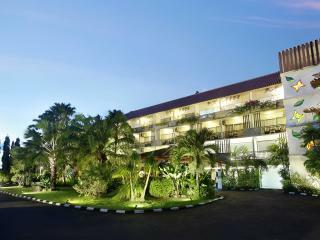 Courtyard by Marriott Bali Nusa Dua Resort is located close to the idyllic beaches of Nusa Dua on the southern coast of Bali. 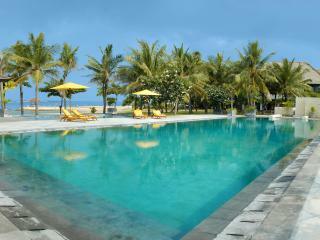 This Bali accommodation offers guest a choice of rooms that feature air-conditioning and spacious living areas. Facilities include a lagoon swimming pool, health club and spa, kids club, poolside bar and a café. Courtyard by Marriott Bali Nusa Dua Resort is a short 10 minute stroll from beach and a 20 minute drive from the main tourist areas of Kuta and Seminyak. Hilton Bali Resort is located on top of a 40 metre cliff overlooking the stunning Indian Ocean and coastline on Bali's most southern tip, Nusa Dua. 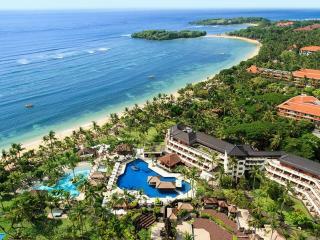 This Bali resort features 389 guest rooms offering views of the landscaped tropical gardens, pool or ocean views. 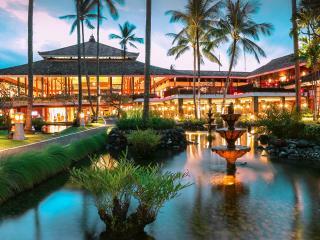 Facilities at the Hilton Bali Resort include 4 interconnecting swimming pools, 5 restaurants, 3 bars and an authentic Balinese amphitheatre. The Jungle Camp Kids Club ensures kids aged from 6 to 11 years are entertained throughout their stay, while parents enjoy a relaxing treatment from the day spa. Hotel Nikko Bali Benoa Beach is located on one of the most stunning beaches in Bali, Tanjung Benoa, famous for its white sandy beach, sparkling waters and watersports. 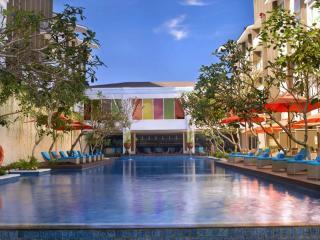 The spacious rooms at Hotel Nikko Bali Benoa Beach are set around a large pool leading to the beach. Facilities include a range of bars and restaurants, swimming pool, fitness centre and The Spa. Ibis Styles Bali Benoa offers guests a choice of 174 rooms and suites that are located 5 minutes from Bali Collection Shopping Mall and 10 minutes from Nusa Dua Beach. Facilities include a swimming pool, Beach Club, spa and beauty salon, fitness centre, poolside bar and a restaurant. From here you can easily access Kuta Beach, Uluwatu Temple and Ubud, which are all within an hour and a half from the resort. A perfect hotel for a luxury getaway, Kayumanis Nusa Dua Private Villa & Spa offers 20 elegant private villas, with a host of superb amenities, set in lush secluded walled gardens, with private tropical pools. Each villa has an individual ethnic or modern decor theme, with a separate sleeping pavilion that emphasizes the traditional island open living style. The hotel offers a range of activities and amenities, including private butler service, cooking classes, spa facilities, yoga and restaurant specializing in Balinese cuisine. Melia Bali, Nusa Dua is located in the heart of Nusa Dua, only a short drive from the International Airport, shopping, restaurants and bars. This Bali accommodation is set amongst 25 acres of lush tropical gardens, with a large lagoon style swimming pool winding through the hotel grounds. 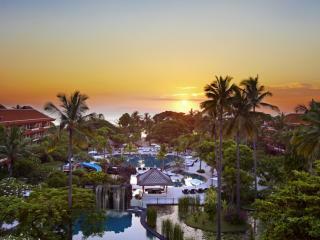 The guest rooms at Melia Bali, Nusa Dua are well appointed with a host of modern amenities. Facilities include a day spa, restaurants and bars and a wide range of water sports and beach activities. 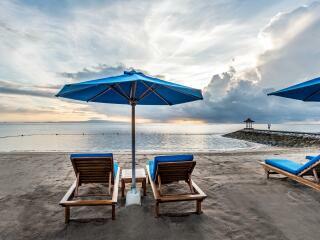 With a waterfront location, excellent facilities and a choice of rooms and villas, Novotel Bali Benoa is the ideal place to base yourself to explore Bali. Situated overlooking Tanjung Benoa Beach in Nusa Dua, Novotel Bali Benoa is only 20 minutes from the International Airport and 30 minutes from the nightlife, shopping, and restaurants of Kuta and Legian. 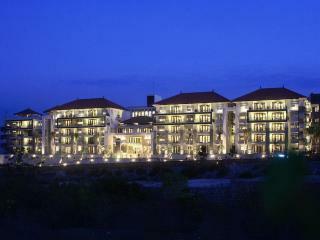 Facilities at the resort include 3 restaurants and bars, a day spa, kids club, tennis court and fitness centre. 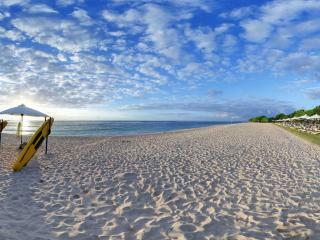 The International Airport in Bali is just a 25 minute drive from the Nusa Dua Beach Hotel & Spa. 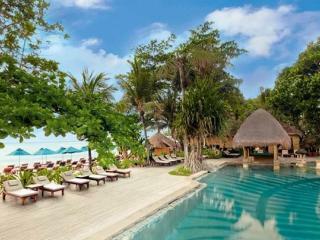 This Bali accommodation offers 381 rooms that feature views of the tropical gardens and the beach. 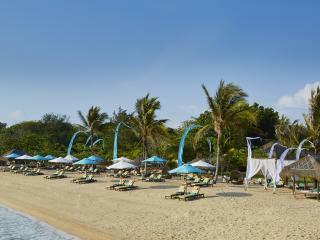 Facilities at Nusa Dua Beach Hotel & Spa includes a swimming pool, restaurants and bars, day spa, kids club plus much more. 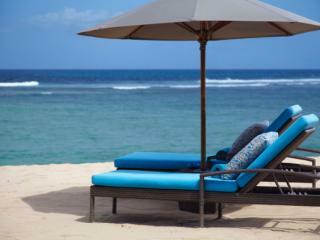 For your next family holiday or couples retreat why not stay at Nusa Dua Beach Hotel & Spa. Park Hotel Nusa Dua Bali offers stunning views over Nusa Dua beach and Benoa Bay from its location atop a steep incline in the Nusa Dua Hills. Guests have a choice of accommodation styles from 1 and 2 Bedroom Suites, to 1 and 2 Bedroom Villas with private pools. Facilities at Park Hotel Nusa Dua Bali include a restaurant and bar, day spa, and 2 swimming pools with one on the rooftop featuring views over Nusa Dua. 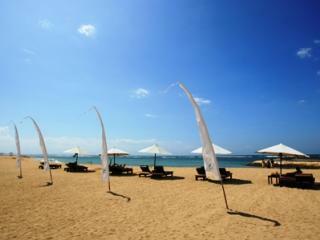 From here you are within easy reach by taxi to the beaches of Nusa Dua, Benoa, Uluwatu and Jimbaran. Sadara Boutique Beach Resort is located right on the beach at Nusa Dua, a short drive from Benoa and the International Airport. 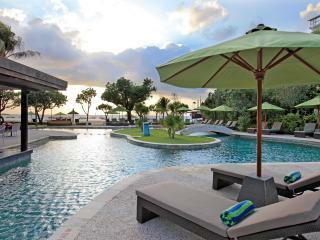 From here you are also within easy access of the tourist meccas of Kuta, Legian and Seminyak. Sadara Boutique Beach Resort offers guests Deluxe Rooms with each featuring views of the landscaped gardens and ocean. Resort facilities include a swimming pool and pool bar, spa treatments, a complimentary shuttle to the shops of Nusa Dua and a restaurant and bar. 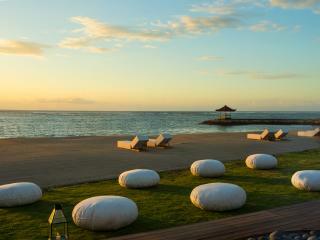 Sol Beach House Bali Benoa is located on the beachfront in one of Bali's newest resort areas, Tanjung Benoa. Sol Beach House Bali Benoa features Geckos Kids Club offering children aged 4 to 12 years fun and educational activities. Famous for its clean beaches and wide variety of water sports, Tanjung Benoa is an ideal location for your next Bali holiday. With close proximity to Geger Beach, and only 20 minutes from the International Airport, Swiss Belhotel Segara located in Nusa Dua is the ideal place to base yourself to enjoy all that Bali has to offer. There are 153 rooms, from Superior Pool View to Superior Loft Rooms. Each room features modern conveniences and have balconies that feature views over the pool and gardens. Facilities include a day spa, restaurant and bar and 2 lagoon swimming pools. The Bali Khama - A Beach Resort & Spa is located in Tanjung Benoa - Nusa Dua, a short 20 minute drive from the International Airport in Bali. Guests can choose from Deluxe Rooms and Studio Suites, and 1 and 2 bedroom villas that feature their own private pools. Facilities include a restaurant and bar, day spa, Olympic size swimming pool, and a free shuttle service to the Nusa Dua area. The Bali Khama - A Beach Resort & Spa is also located within close proximity to the Bali Collection Shopping Centre in Nusa Dua. The Tanjung Benoa Beach Resort Bali is set at the tip of Tanjung Benoa peninsula along Bali's most southern region, Nusa Dua. The rooms at this Bali accommodation are designed in contemporary Balinese style, and guests have the choice of 1 or 2 bedroom cottages with a private plunge pool, which are ideal for a family holiday or Bali honeymoon. The lavish cottages will ensure a tropical experience on your next Bali holiday. 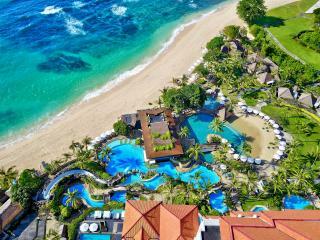 The Westin Resort Nusa Dua is a luxury beachfront resort located on an exclusive enclave of Nusa Dua. The beautiful rooms at The Westin Resort are surrounded by tropical landscaped gardens and offer total comfort, complete with the renowned Heavenly Bed and private balconies/terraces with stunning views of the gardens, or pool. Facilities include restaurants, bars, Day Spa, tennis courts and the Westin Family kids club.